About 75 percent of the 1.3 million-plus licensed attorneys in the U.S. work in private practice. Lawyers are considered to work in private practice when they're part of a firm with two or more attorneys, or they have a solo practice. 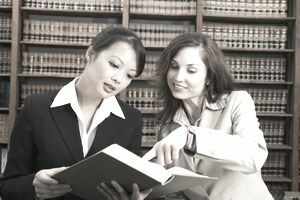 Lawyers employed in a law firm might work as partners who share the firm's profits and risks, or as associates—attorneys who have not yet reached full partnership status. Law firms also employ numerous other legal professionals, including legal secretaries and paralegals, law clerks, IT personnel, litigation support professionals, law firm administrators, marketing personnel, file clerks, and legal medical consultants. Law firm professionals are charged with the onerous task of tracking pretty much every minute of their time so the firm can bill those minutes to their clients. Law firms frequently impose high monthly and yearly billable hour requirements upon partners, associates, and paralegals, making law firm employment among the most demanding of legal practice environments. Time is typically billed in six-minute increments, so a two-minute phone call would be charged at six minutes. Time might be billed to clients on a monthly basis, but it's more often charged against retainer fees paid by clients that are held on deposit by the firm. Fees for time might also be subtracted from any monetary damages the lawyer wins for the client. Law firms are notorious for requiring long work hours from their employees to raise revenues. But although 50 to 80 hour work weeks are common in some law firms, not all firms are sweatshops. Each has its own unique culture and work requirements. In some cases, the time demands placed upon law firm professionals limit their ability to pursue outside interests and family life. A survey by the Texas Bar Association found that 18 percent of respondents would exchange lower compensation for fewer hours at the office and in court, even if it affected their potential for advancement. According to the Lawyer Statistical Report, only 14 percent of attorneys are employed in large law firms of more than 100 lawyers. The American Bar Association puts the number at about 16 percent. The large majority of attorneys—about 63 percent—and law firm employees work in smaller offices of 10 attorneys or less. Working in a law firm has its unique benefits and challenges, and significant differences exist between employment in a small firm versus employment in a large firm.